Monday this week was Internet Safety Day, and to celebrate, Google is dedicating the whole week to protecting its users with advice and tools. To that end, Google has produced a series of articles on its blog, filled with online security tips. From password checking tools to teaming up with Disney to promote safety online for kids, Google has really been throwing itself into the concept of keeping secure online. We take a look at the highlights of Google’s latest advice, and more ways you can stay safe online. Password Checkup is a new automated tool from Google that you can add to the Chrome browser. It informs you if any of your passwords are compromised. With last week seeing the news that over 2 billion login details had been illegally obtained, the tool should be a welcome one. The tool is a Chrome browser extension, and works by informing the user if one of the username/password combinations that they regularly use turns up in its list of compromised data, which is states amounts to over 4 billion credentials. If spotted, Chrome will prompt you to change your password immediately, to mitigate the chance of any details being stolen. The extension is available now. Should your account be compromised, Google now has a set of tools to help you manage the problem. However, it states that, until now, these protections haven’t extended to apps and sites that also utilize Google Sign In. That’s set to change with Cross Account Protection. When implemented, it will enable apps and sites to receive information from Google about security events, such as an account hijacking, so that they can also offer the user protection. The intention is to get ahead of the fraudsters, by sharing information within the Google infrastructure. Google states that the data it passes on will be limited, and will only happen when absolutely necessary. It could happen if a security issue has occurred on your Google account, or if any generally suspicious activity was detected. In an effort to raise awareness for children’s online safety, Google has teamed up with Disney, and specifically the movie Ralph Breaks the Internet. It’s hard to imagine a better placed film to use as an opportunity to inform kids about how to stay safe online – at least Google didn’t pick The Emoji Movie. It’s also expanding its Be Internet Awesome campaign. Google has created a guide that encourages parents to discuss the internet with their children, and gives advice on best practice. Then there’s its partnership with the David’s Legacy Foundation, in which teens are partnered with younger children to mentor them to be kind to others online. The charity is dedicated to raising awareness of cyberbulling online, and believes that it’s teens, not adults, that make the best role models for children when it comes to being positive online. 1: Set up a recovery email or phone number – According to Google, most of us already have a recovery email or phone number for our accounts. But, those who don’t run the risk of serious trouble getting back into their accounts if these are compromised. 2: Use unique passwords – Google says that 65% of people use the same password across multiple sites. That’s bad. If your password gets out there, a hacker could cause havoc across multiple sites and services that you use with just one set of details. The advice is to keep your passwords unique. We strongly believe that a password manager can remove the headache of thinking up and remembering multiple passwords. 3. Keep your software up to date – Software updates may seem a pain, but they keep your device protected from the latest known hacks and exploits. Accept that update request whenever it pops up. 4. Use two-factor authentication – Two-factor authentication is one of the best tools for beating hackers, as it depends on you having access to a separate device, usually your mobile phone, to verify you are who you say you are. It’s a security step that is hard to beat. 5. 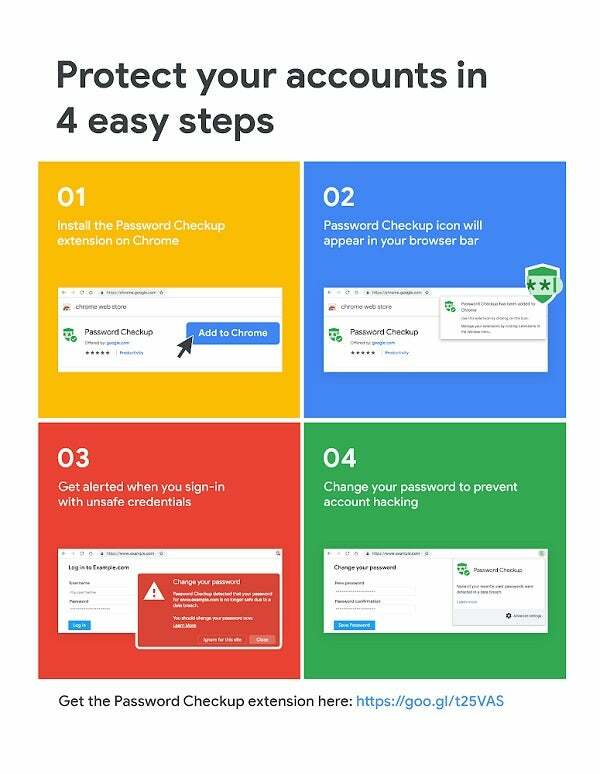 Take Google’s Security Checkup – This is an online assessment from Google that assesses your Google account, and recommends ways to improve any flaws found, as well as informing you of any recent security events and third party access. One of the best ways to manage your online safety is to ensure that your login details are firstly unique, and secondly, hard to crack. With may of us juggling multiple passwords across various services and sites, remembering all of them can be a tall order. That’s where password managers come in. Usually, a password manager works as app that connects to your browser – the best ones can be used across multiple devices. Password managers remember your log in details for you – you only need to remember one master password for the manager itself. Not only that, but they can also suggest new, secure passwords to use, and alert you should your account be compromised.